So here’s two reasons why animal protein should not be overlooked as a smart dietary choice. Animal proteins are a complete protein - Here’s a bit of a surprise but not all proteins are created equal. There are two types of protein, complete and incomplete. A complete protein is a single food source with a full range of our body’s essential building blocks, called amino acids, they are generally an animal-based protein. Incomplete proteins generally come from plant-based protein and don’t contain the full suite of essential amino acids. That’s not to say you can’t get all your amino acids from a vegetarian diet but you do have to be knowledgeable on how to mix your plant-based proteins to ensure your get the full range. Meat’s Calorie Advantage - Now we’re not for a moment suggesting you should start counting calories. Let’s not go back to those days! However meat is incredibly nutrient dense when it comes to protein. 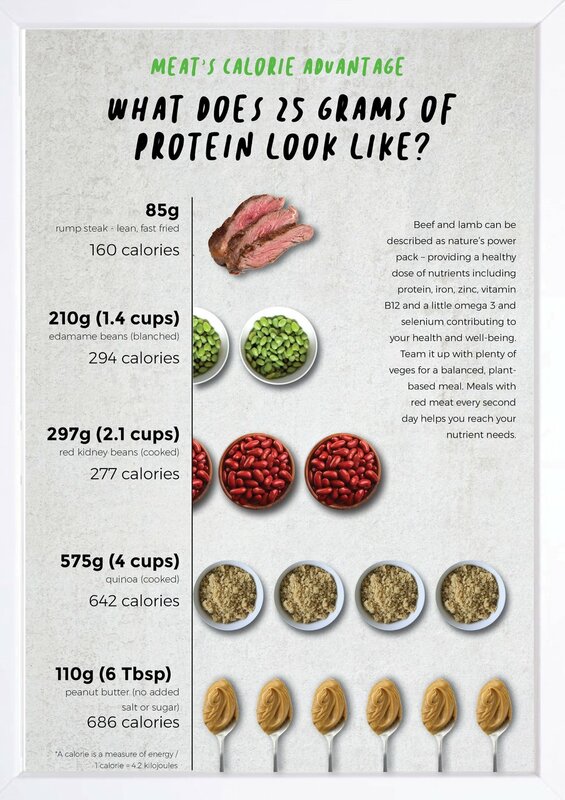 Case in point is that to get 25 grams of protein you’d need to eat six tablespoons of peanut butter or four cups of quinoa at approximately four times the amount of calories of an 85 gram piece of lean rump steak. So with red meat you’re getting a lot for a little and of course let’s not forget the raft of vitamins and minerals such as iron, zinc, selenium and B vitamins that we also gain from red meat. This calorie advantage is important for those with higher protein requirements, such as athletes and our aging population. Complete protein plays a key role in maintaining muscle function and strength and reducing frailty in the older years. An additional bonus is that including protein at each meal increases satiety, i.e. keeping us feeling fuller for longer and assisting with weight loss or maintenance1. Here’s a dilemma, often as we age our appetite decreases yet the protein requirements for people aged over 70 years is 25 percent higher than for younger adults2. So for this age group it’s even more important to make high quality, nutrient dense, protein choices. Registered nutritionist, Anna Mrkusic who coordinates the New Zealand Nutrition Foundation JUST COOK for Healthy Ageing programme, understands the importance of protein for older adults. Their programme meals must be tasty, simple, affordable and nutritious and she ensures all recipes are high in a variety of different protein sources, including lean red meat. The programme cookbook includes five beef recipes and all recipes are packed with seasonal vegetables to maximise the nutritional intake of each meals. Anna shares that one of the more popular programme recipes is a “chilli con carne which combines lean mince beef with baked beans and tons of veggies, served alongside a Mexican salsa and brown basmati rice”. Seriously yum and ‘Nature’s power pack’ again! Ministry of Health. 2013. Food and Nutrition Guidelines for Healthy Older People: A background paper. Wellington: Ministry of Health.